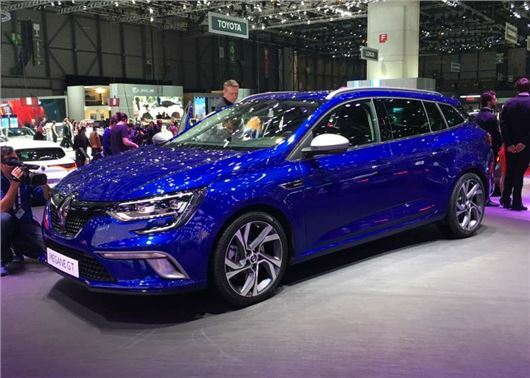 The new Renault Megane Sport Tourer has been unveiled at the Geneva Motor Show. The estate version of the new Megane hatch will start from £18,000 when it reaches UK showrooms in September. Engine options are the same as those available for the new Megane hatch, with two turbocharged petrols and four diesels. Outputs for UK versions are still to be confirmed, but expect power ratings to vary from 100PS to 205PS. ﻿The GT model at the show, like the GT variant of the hatchback, gets a four-wheel steering system called 4Control, designed to make the car feel more agile, whether on a twisting road or in tight urban traffic. It also shares the hatchback’s standard equipment, including a large touchscreen system and a TFT instrument binnacle. Bootspace remains the same as the old Megane estate - 580 litres - although the load length has been improved to take 2.8 metres. The boot can also be split into two compartments to prevent items falling over and rolling around in the back.